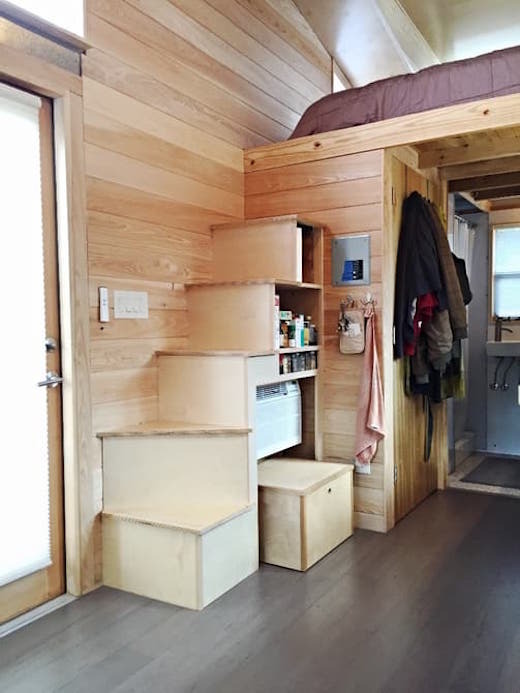 Tiny homes can quite easily feel cramped and a lot like living in a box, which is why good design and layout are so very important. Installing large windows that let in plenty of natural light also makes all the difference. 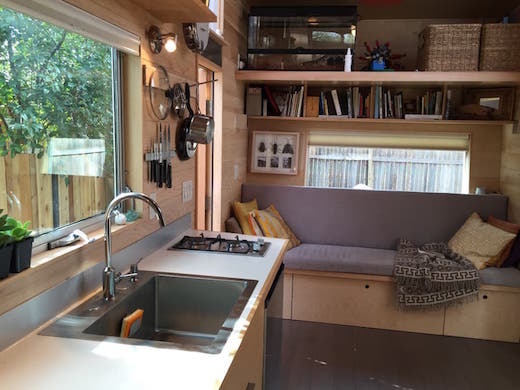 And all those things were blended into a perfect tiny home by architect Ann Armstrong of Austin, Texas. 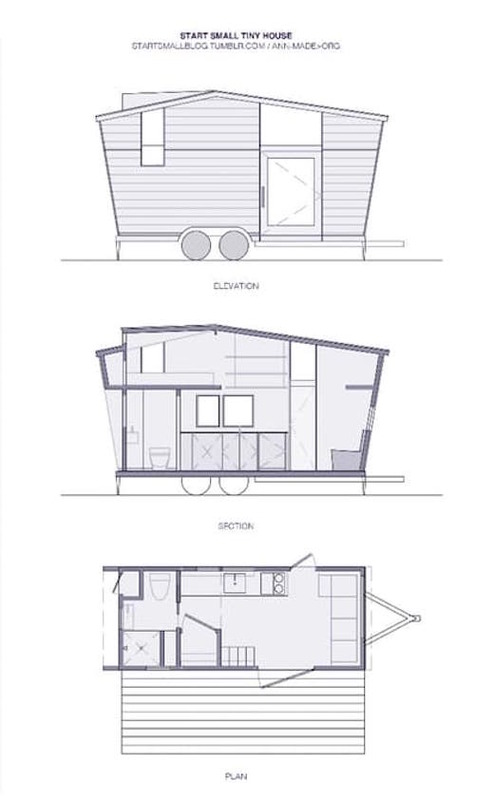 She designed and built this towable tiny house for herself as a full time residence. 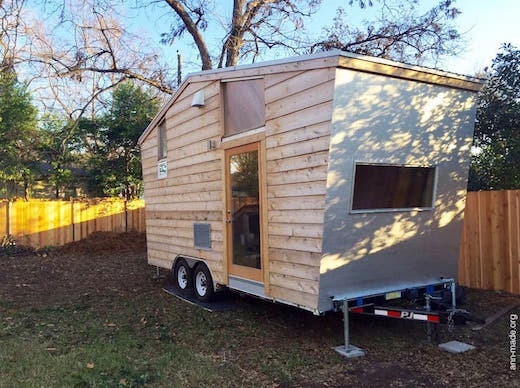 The so-called Start Small tiny house measures just 20 by 8.6 ft (6 by 2.6 m), and looks a lot like a small wooden trailer. It is clad in cedar with aluminum siding, and has a metal roof. She used polyiso rigid foam for insulation in the floor and 3.5-inch (8.89 cm) closed-cell spray foam to insulate the walls. The home is fitted with 10 windows, which lets in an ample amount of natural light, and has two doors. This is rarely seen in tiny homes, but it does offer great ventilation, let’s in even more light when opened, and is great in case of an emergency. The home features a living area with a sofa, and plenty of shelves and other storage nooks. 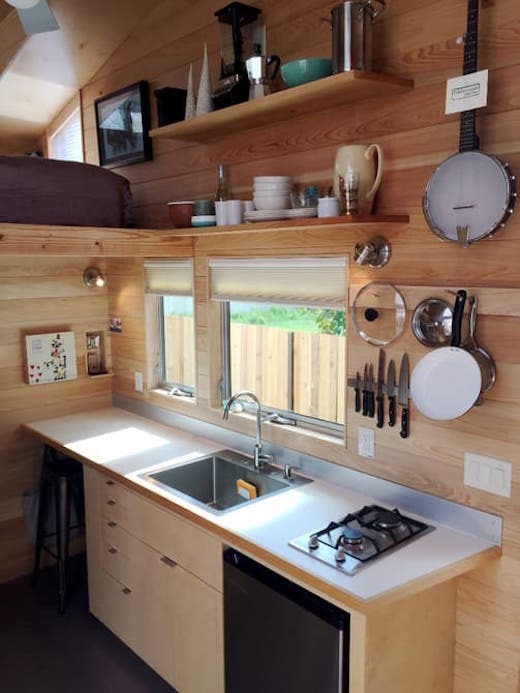 There is also a kitchenette, which is fitted with a two-burner stove, a fridge and sink, and appears quite spacious given its diminutive size. The home also features a bathroom equipped with a composting toilet, sink and shower. There is also a storage area located at one end of the home, which works to leave the interior clutter free. The sleeping area is located in a loft, which is accessible via a set of stairs that double as storage. The loft is large enough for a double bed, and not much else, but it has plenty of windows, so it doesn’t feel cramped in the least. 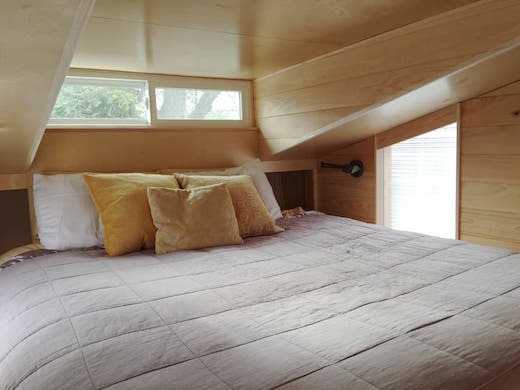 There is also a second loft, which can be used as a guest bedroom or an additional storage area and is accessible by a ladder. The home also features a wall heater/air-conditioning unit, and the hot water needs are taken care of by an on-demand hot water heater.